Election commission to investigate incident after videos circulate of ballots scattered through a warehouse in neighboring Malaysia. Indonesia’s Election Commission said Thursday it is sending officials to investigate after videos circulated online of thousands of ballots for next week’s polls scattered throughout a warehouse in neighboring Malaysia. One of the videos shows police at the warehouse in Malaysia’s Selangor state and people holding up voting papers and commenting they’d been marked in favor of Indonesian President Joko “Jokowi” Widodo and legislative candidates for parties in his coalition. Another video, apparently from a second location in Malaysia, shows two women making holes in ballots, which is how a vote is marked in Indonesia’s elections. Presidential and legislative elections in Indonesia, the world’s third-largest democracy after India and the United States, are set for April 17. Saputra said Indonesians living in Malaysia would vote on Sunday and ballots had been sent to the country a week ago. He said the Overseas Electoral Commission advised that it hadn’t rented a shophouse in Malaysia, a term for a low-rise business premise that also doubles as a residence. Yaza Azzhara, who heads the Indonesian election monitoring committee for Kuala Lumpur in Malaysia, told TVOne there were an estimated 10,000-20,000 ballots found in two locations. She said that she and opposition representatives opened some of the voting papers, which were postal ballots, and they’d been marked for Jokowi and his running mate. In other cases, they were marked for a Jokowi-allied legislative candidate who’s the son of Indonesia’s ambassador to Malaysia. “When I arrived at the first location, the shophouse door was open. According to some members (of the opposition committee) who suspected that there was a pile of ballot papers inside, they entered through a window and opened the door from inside,” Azzhara said. Some of the ballots were in brown bags with official Overseas Electoral Commission padlocks and these hadn’t been marked, she said. Opinion polls from the second half of March showed Jokowi had a large lead over his challenger, former special forces general Prabowo Subianto, but as many as 20 percent of voters were undecided. Subianto narrowly lost to Jokowi in 2014. 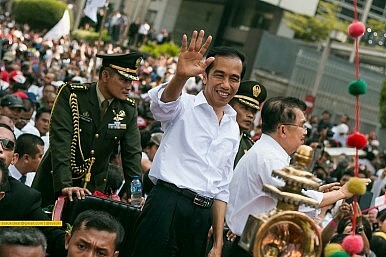 While campaigning in a Jakarta satellite city, Jokowi told reporters he had ordered an investigation into the marked ballots. “If that’s true, it’s a violation and should be reported to the National Election Supervisory Board,” he said. Reported by The Associated Press. Preliminary results suggest Joko Widodo has triumphed over rival candidate Prabowo Subianto.